The three-light window of the south aisle depicting the Resurrection Morning was made by one of Britain’s oldest glass manufacturers. In 1935, Wellington merchant and philanthropist Sir George Shirtcliffe had the windows installed at St Paul’s in memory of his first wife, Jane Barbara Shirtcliffe. 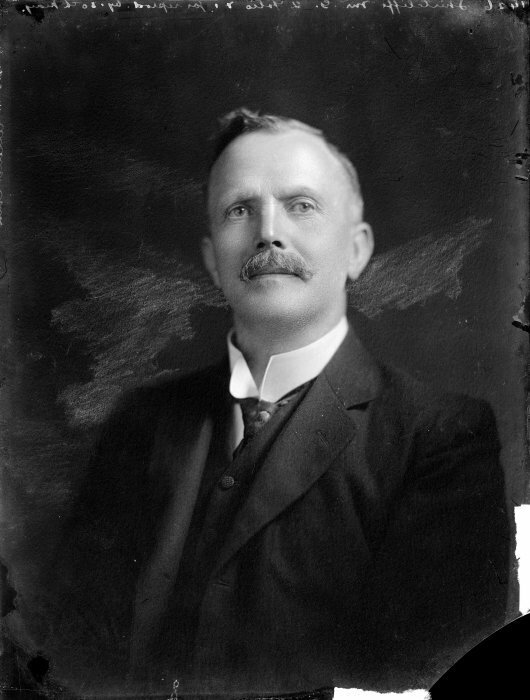 The Shirtcliffes Sir George Shirtcliffe (1862-1941) was a prominent businessman, a member of several important government commissions and served on a number of public and semi-public bodies, and was knighted in 1936. He also exhibited a strong presence within the church community, donating tens of thousands of pounds to St Paul’s, the Wellington Diocesan Board and other Christian groups such as the YMCA, YWCA and St Mary’s Guild. At his funeral Bishop Sprott noted that he had served every role in the church it was possible for a layman to hold. He also donated works to the National Art Gallery and endowed £20,000 to the New Zealand University to enable students to continue their study, thereby establishing the Shirtcliffe Fellowship that still exists today. Interestingly, he also left £5,000 for children’s playgrounds and equipment in Wellington. Perhaps these donations reveal more about Sir George Shirtcliffe than do his business ventures. So too might the three windows in St Paul’s tell us a bit more about his family life. Shirtcliffe married Jane Barbara Massey in Timaru in February 1889. Together they had two sons and three daughters. Jane was also involved with the church and community. Her death in 1926 was deeply felt by those in the Girls’ Friendly Society, to which she was vice-president. In an Evening Post article of the time, it was stated that ‘Mrs. Shirtcliffe had gone at a time when her place was hard to fill’. The windows were placed in the church in 1935, almost ten years after Jane’s death. A brass plaque on the same wall commemorates Zella (Judy) Hunter. She was engaged to marry the Shirtcliffe’s son, George Geoffrey, only to have tragically died at the age of 22. It seems the Shirtcliffe men had not forgotten the important women in their lives. These memorials were placed near the Shirtcliffe’s pew, during the time when families paid rent for a particular pew. Plaques for Sir George, his second wife Nancy and his son George are also in that area of the church. The Shirtcliffe family have maintained a strong connection to the church ever since. The vibrant windows commissioned by Shirtcliffe were designed and produced by Powell and Sons (Whitefriars), Ltd. The Whitefriars Glass Company, believed to have been established in 1680, was purchased by a London wine merchant and entrepreneur, James Powell in 1834. One of their main productions was stained glass windows for churches; however, they also made other glassware such as vases and goblets. 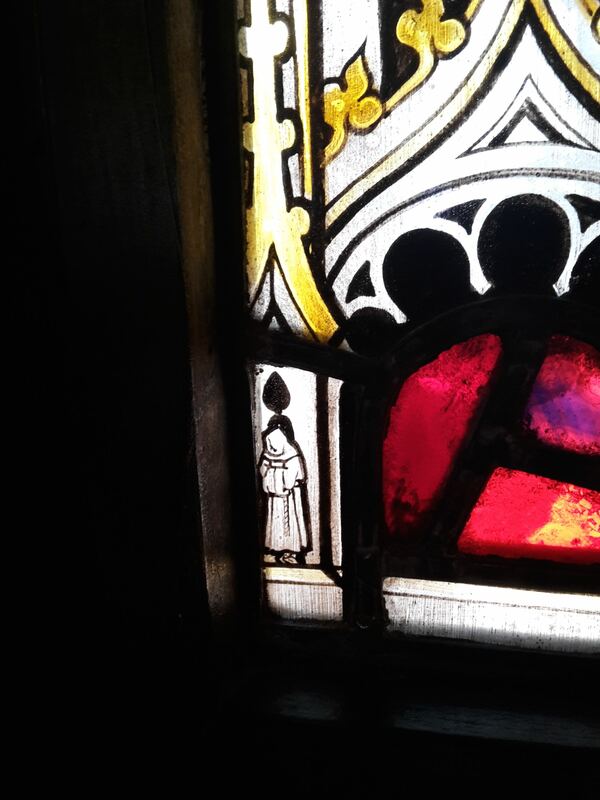 If you look closely at the Resurrection Morning in Old St Paul’s, you may find the ‘hidden’ monk – a small figure of a white friar that was used as the manufacturer’s trademark. There are other examples of Whitefriars Glass in Wellington including the nave windows of the Wellington Cathedral of St Paul and the Hall of Memories windows in the Carillon. With the high cost of handmade glass and economic losses in the late 1970s, the Whitefriars factory site was bulldozed and the company closed in 1980. Images: G Shirtcliffe. S P Andrew Ltd: Portrait negatives. Ref: 1/1-014839-G. Alexander Turnbull Library, Wellington, New Zealand. http://natlib.govt.nz/records/22717995.